The positive trend we have seen in the last few weeks continues, and the candles are painted green. Bitcoin and Ethereum are climbing steadily, and new money is entering the market alongside a trading volume that is beginning to gain momentum. Of course, the Alternative coins did not ignore the celebration, and not surprisingly, they follow the trend and even hung onto a small piece of Bitcoin’s market dominance. As usual, it is better not to look for the reasons for crypto’s volatility because to attribute reasons for increases in crypto is like finding an electron in persimmon. The veteran market players have long learned that the crypto market is not at all expected. Meanwhile, the short traders have taken a rest until the next correction. Craig Wright is in the headlines again, and this time he is willing to swear he is Satoshi to prove the claim. Now, do you believe? 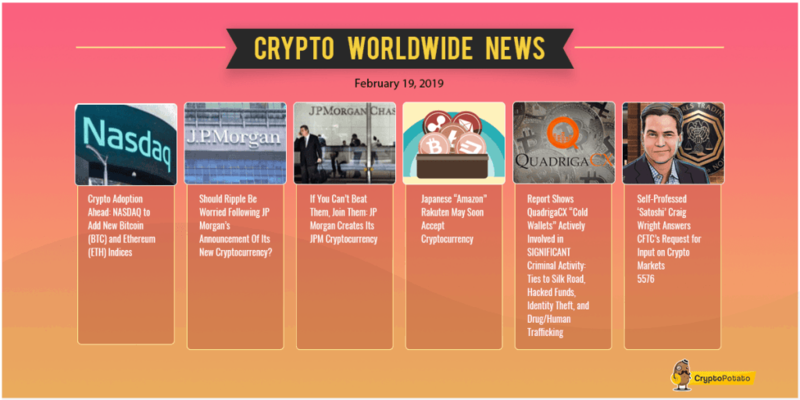 JPMorgan has taken out its own stable coin, and whether we like it or not, this news has many ramifications for the crypto market, both on the popularity of governed currencies working in the financial system like Ripple and on the popularity of decentralized currencies such as Bitcoin. Mainly, because the essential difference between the different types of currencies is still unclear to the majority of the public. There also seems to be progress in the regulatory sector, and the market has already begun to get used to the idea that the establishment’s feet are planted deep in the ecosystem. The US reporting season has already started, and after the deeps of last year many new players will want to offset their losses from the Crypto market, and therefore the percentage of those reporting is expected to rise. In addition, the Bitcoin ETF‘s continues to star in the headlines and this time Bitwise and NYSE Arca are the ones who have submitted a new application which is knocking on the SEC door. In conclusion, after a difficult year with many blows to investors and traders, the market is gaining confidence, and there is already hesitant talk about whether we may have reached the floor and that a new wave is ahead of us. However, it is still too early to say that the Alts season is yet to come or that something substantial has changed in the market since the recent rises or the falls that followed. Crypto Adoption Ahead: NASDAQ to Add New Bitcoin (BTC) and Ethereum (ETH) Indices. Will we get to a time when Bitcoin and Ether will be directly traded on NASDAQ? The top U.S stock exchange just added a tracker for the major cryptocurrencies. If You Can’t Beat Them, Join Them: JP Morgan Creates Its JPM Cryptocurrency. After criticizing Bitcoin, JP Morgan Chase Bank and it’s CEO, Dimon, just made an unexpected entry into the cryptocurrency industry with their stablecoin dubbed JPM Coin. Japanese “Amazon” Rakuten May Soon Accept Cryptocurrency. The retail giant will soon follow up its acquisition of a crypto exchange with global support for the millions of its shoppers who want to pay in cryptocurrencies. Should Ripple Be Worried Following JP Morgan’s Announcement Of Its New Cryptocurrency? With JP Morgan claiming that its new cryptocurrency will facilitate cross border payments, crypto project, Ripple may be in for its first real competition. Report Shows QuadrigaCX “Cold Wallets” Actively Involved in SIGNIFICANT Criminal Activity: Ties to Silk Road, Hacked Funds, Identity Theft, and Drug/Human Trafficking. While the legal system continues to seek answers regarding the troubled New-Zealand based exchange, fresh reports confirm that the allegedly locked cold wallets were used to do dirty business. Self-Professed ‘Satoshi’ Craig Wright Answers CFTC’s Request for Input on Crypto Markets. The Bitcoin SV pioneer has resurrected claims that he is the anonymous “Satoshi Nakamoto” who invented Bitcoin in 2008 and is willing to take an oath to prove this. 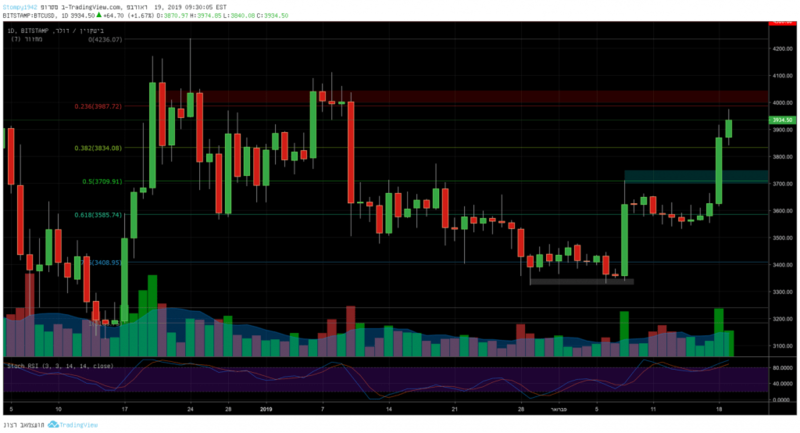 This week we have chart analysis of Bitcoin, Ethereum, Ripple, EOS and Binance Coin (BNB) – Read more here.